For other uses, see Paramedics (disambiguation). A paramedic is a specialist healthcare professional who responds to emergency calls for medical help outside of a hospital. Paramedics mainly work as part of the emergency medical services (EMS), most often in ambulances. The scope of practice of a paramedic varies among countries, but generally includes autonomous decision making around the emergency care of patients. Not all ambulance personnel are paramedics, although the term is sometimes used informally to refer to any ambulance personnel. In English-speaking countries, there is an official distinction between paramedics and emergency medical technicians (or emergency care assistants), in which paramedics have additional qualifications and are accountable to a professional regulatory body. The role of a paramedic varies widely across the world, as EMS providers operate with many different models of care. In the Anglo-American model, paramedics are autonomous decision-makers. In some countries such as the United Kingdom and South Africa, the paramedic role has developed into an autonomous health profession. In the Franco-German model, ambulance care is led by physicians. In some versions of this model, such as France, there is no direct equivalent to a paramedic. Ambulance staff have either the more advanced qualifications of a physician or less advanced training in first aid. In other versions of the Franco-German model, such as Germany, paramedics do exist. Their role is to support a physician in the field, in a role more akin to a hospital nurse, rather than operating with clinical autonomy. The development of the profession has been a gradual move from simply transporting patients to hospital, to more advanced treatments in the field. In some countries, the paramedic may take on the role as part of a system to prevent hospitalisation entirely and, through practitioners, are able to prescribe certain medications, or undertaking 'see and refer' visits, where the paramedic directly refers a patient to specialist services without taking them to hospital. Throughout the evolution of pre-hospitalisation care, there has been an ongoing association with military conflict. One of the first indications of a formal process for managing injured people dates from the Imperial Legions of Rome, where aging Centurions, no longer able to fight, were given the task of organizing the removal of the wounded from the battlefield and providing some form of care. Such individuals, although not physicians, were probably among the world's earliest surgeons by default, being required to suture wounds and complete amputations. A similar situation existed in the Crusades, with the Knights Hospitaller of the Order of St. John of Jerusalem filling a similar function; this organisation continued, and evolved into what is now known throughout the Commonwealth of Nations as the St. John Ambulance and as the Order of Malta Ambulance Corps in the Republic of Ireland and various countries. While civilian communities had organized ways to deal with prehospitalisation care and transportation of the sick and dying as far back as the bubonic plague in London between 1598 and 1665, such arrangements were typically ad hoc and temporary. In time, however, these arrangements began to formalize and become permanent. During the American Civil War, Jonathan Letterman devised a system of mobile field hospitals employing the first uses of the principles of triage. After returning home, some veterans began to attempt to apply what had they had seen on the battlefield to their own communities, and commenced the creation of volunteer life-saving squads and ambulance corps. These early developments in formalized ambulance services were decided at local levels, and this led to services being provided by diverse operators such as the local hospital, police, fire brigade, or even funeral directors who often possessed the only local transport allowing a passenger to lie down. 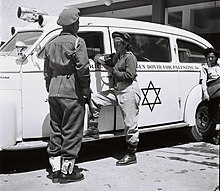 In most cases these ambulances were operated by drivers and attendants with little or no medical training, and it was some time before formal training began to appear in some units. An early example was the members of the Toronto Police Ambulance Service receiving a mandatory five days of training from St. John as early as 1889. Prior to World War I motorized ambulances started to be developed, but once they proved their effectiveness on the battlefield during the war the concept spread rapidly to civilian systems. In terms of advanced skills, once again the military led the way. During World War II and the Korean War battlefield medics administered painkilling narcotics by injection in emergency situations, and pharmacists' mates on warships were permitted to do even more without the guidance of a physician. The Korean War also marked the first widespread use of helicopters to evacuate the wounded from forward positions to medical units, leading to the rise of the term "medivac". These innovations would not find their way into the civilian sphere for nearly twenty more years. By the early 1960s experiments in improving medical care had begun in some civilian centres. One early experiment involved the provision of pre-hospital cardiac care by physicians in Belfast, Northern Ireland, in 1966. This was repeated in Toronto, Canada in 1968 using a single ambulance called Cardiac One, which was staffed by a regular ambulance crew, along with a hospital intern to perform the advanced procedures. While both of these experiments had certain levels of success, the technology had not yet reached a sufficiently advanced level to be fully effective; for example, the Toronto portable defibrillator and heart monitor was powered by lead-acid car batteries, and weighed around 45 kilograms (99 lb). In 1966, a report called Accidental Death and Disability: The Neglected Disease of Modern Society—commonly known as The White Paper—was published in the United States. This paper presented data showing that soldiers who were seriously wounded on the battlefields during the Vietnam War had a better survival rate than individuals who were seriously injured in motor vehicle accidents on California's freeways. Key factors contributing to victim survival in transport to definitive care such as a hospital were identified as comprehensive trauma care, rapid transport to designated trauma facilities, and the presence of medical corpsmen who were trained to perform certain critical advanced medical procedures such as fluid replacement and airway management. As a result of The White Paper, the US government moved to develop minimum standards for ambulance training, ambulance equipment and vehicle design. These new standards were incorporated into Federal Highway Safety legislation and the states were advised to either adopt these standards into state laws or risk a reduction in Federal highway safety funding. The "White Paper" also prompted the inception of a number of emergency medical service (EMS) pilot units across the US including paramedic programs. The success of these units led to a rapid transition to make them fully operational. New York City's Saint Vincent's Hospital developed the United States' first Mobile Coronary Care Unit (MCCU) under the medical direction of William Grace, MD, and based on Frank Pantridge's MCCU project in Belfast, Northern Ireland.[when?] In 1967, Eugene Nagle, MD and Jim Hirschmann, MD helped pioneer the United States' first EKG telemetry transmission to a hospital and then in 1968, a functional paramedic program in conjunction with the City of Miami Fire Department. In 1969, the City of Columbus Fire Services joined together with the Ohio State University Medical Center to develop the "HEARTMOBILE" paramedic program under the medical direction of James Warren, MD and Richard Lewis, MD. In 1969, the Haywood County (NC) Volunteer Rescue Squad developed a paramedic program (then called Mobile Intensive Care Technicians) under the medical direction of Ralph Feichter, MD. In 1969, the initial Los Angeles paramedic training program was instituted in conjunction with Harbor General Hospital, now Harbor–UCLA Medical Center, under the medical direction of J. Michael Criley, MD and James Lewis, MD. In 1969, the Seattle "Medic 1" paramedic program was developed in conjunction with the Harborview Medical Center under the medical direction of Leonard Cobb, MD. The Marietta (GA) initial paramedic project was instituted in the Fall of 1970 in conjunction with Kennestone Hospital and Metro Ambulance Service, Inc. under the medical direction of Luther Fortson, MD. The Los Angeles County and City established paramedic programs following the passage of The Wedsworth-Townsend Act in 1970. Other cities and states passed their own paramedic bills, leading to the formation of services across the US. Many other countries also followed suit, and paramedic units formed around the world. In the military, however, the required telemetry and miniaturization technologies were more advanced, particularly due to initiatives such as the space program. It would take several more years before these technologies drifted through to civilian applications. In North America, physicians were judged to be too expensive to be used in the pre-hospital setting, although such initiatives were implemented, and sometimes still operate, in European countries and Latin America. While doing background research at Los Angeles' UCLA Harbor Medical Center for a proposed new show about doctors, television producer Robert A. Cinader, working for Jack Webb, happened to encounter "firemen who spoke like doctors and worked with them". This concept developed into the television series Emergency!, which ran from 1972 to 1979, portraying the exploits of this new profession called paramedics. The show gained popularity with emergency services personnel, the medical community, and the general public. When the show first aired in 1972, there were just six paramedic units operating in three pilot programs in the whole of the US, and the term paramedic was essentially unknown. By the time the program ended in 1979, there were paramedics operating in all fifty states. The show's technical advisor, James O. Page, was a pioneer of paramedicine and responsible for the UCLA paramedic program; he would go on to help establish paramedic programs throughout the US, and was the founding publisher of the Journal of Emergency Medical Services (JEMS). The JEMS magazine creation resulted from Page's previous purchase of the PARAMEDICS International magazine. Ron Stewart, the show's medical director, was instrumental in organizing emergency health services in southern California earlier in his career during the 1970s, in the paramedic program in Pittsburgh, and had a substantial role in the founding of the paramedic programs in Toronto and Nova Scotia, Canada. Throughout the 1970s and 1980s, the paramedic field continued to evolve, with a shift in emphasis from patient transport to treatment both on scene and en route to hospitals. This led to some services changing their descriptions from "ambulance services" to "emergency medical services". Bicycle paramedics in Los Angeles indicate the changing nature of the job. The training, knowledge-base, and skill sets of both paramedics and emergency medical technicians (EMTs) were typically determined by local medical directors, what it was felt the community needed, and what was affordable. There were also large differences between localities in the amount and type of training required, and how it would be provided. This ranged from in-service training in local systems, through community colleges, and up to university level education. This emphasis on increasing qualifications has followed the progression of other health professions such as nursing, which also progressed from on the job training to university level qualifications. The variations in educational approaches and standards required for paramedics has led to large differences in the required qualifications between locations—both within individual countries and from country to country. Within the UK training is a three-year course equivalent to a bachelor's degree. Comparisons have been made between Paramedics and nurses; with nurses now requiring degree entry (BSc) the knowledge deficit is large between the two fields. This has led to many countries passing laws to protect the title of "paramedic" (or its local equivalent) from use by anyone except those qualified and experienced to a defined standard. This usually means that paramedics must be registered with the appropriate body in their country; for example all paramedics in the United Kingdom must by registered with the Health Professions Council in order to call themselves a paramedic. In the United States, a similar system is operated by the National Registry of Emergency Medical Technicians (NREMT), although this is only accepted by forty of the fifty states. As paramedicine has evolved, a great deal of both the curriculum and skill set has existed in a state of flux. Requirements often originated and evolved at the local level, and were based upon the preferences of physician advisers and medical directors. Recommended treatments would change regularly, often changing more like a fashion than a scientific discipline. Associated technologies also rapidly evolved and changed, with medical equipment manufacturers having to adapt equipment that worked adequately outside of hospitals, to be able to cope with the less controlled pre-hospital environment. Physicians began to take more interest in paramedics from a research perspective as well. By about 1990, the fluctuating trends began to diminish, being replaced by outcomes-based research. This research then drove further evolution of the practice of both paramedics and the emergency physicians who oversaw their work, with changes to procedures and protocols occurring only after significant research demonstrated their need and effectiveness (an example being ALS). Such changes affected everything from simple procedures such as CPR, to changes in drug protocols. As the profession grew, some paramedics went on to become not just research participants, but researchers in their own right, with their own projects and journal publications. In 2010, the American Board of Emergency Medicine created a medical subspecialty for physicians who work in emergency medical services. Changes in procedures also included the manner in which the work of paramedics was overseen and managed. In the early days medical control and oversight was direct and immediate, with paramedics calling into a local hospital and receiving orders for every individual procedure or drug. While this still occurs in some jurisdictions, it has become increasingly rare. Day-to-day operations largely moved from direct and immediate medical control to pre-written protocols or standing orders, with the paramedic typically seeking advice after the options in the standing orders had been exhausted. Firefighters assist while paramedics from the Toronto Paramedic Services load a patient into an ambulance. While the evolution of paramedicine described above is focused largely on the US, many other countries followed a similar pattern, although often with significant variations. Canada, for example, attempted a pilot paramedic training program at Queen's University, Kingston, Ontario, in 1972. The program, which intended to upgrade the then mandatory 160 hours of training for ambulance attendants, was found to be too costly and premature. The program was abandoned after two years, and it was more than a decade before the legislative authority for its graduates to practice was put into place. An alternative program which provided 1,400 hours of training at the community college level prior to commencing employment was then tried, and made mandatory in 1977, with formal certification examinations being introduced in 1978. Similar programs occurred at roughly the same time in Alberta and British Columbia, with other Canadian provinces gradually following, but with their own education and certification requirements. Advanced Care Paramedics were not introduced until 1984, when Toronto trained its first group internally, before the process spread across the country. By 2010 the Ontario system involved a two-year community college based program, including both hospital and field clinical components, prior to designation as a Primary Care Paramedic, although it is starting to head towards a university degree-based program. In Israel, paramedics are trained in either of the following ways: a three-year degree in Emergency Medicine (B.EMS), a year and three months IDF training, or MADA training. Paramedics manage and provide medical guidelines in mass casualty incidents. They operate in MED evac and ambulances. They are legalized under the 1976 Doctors Ordinance (Decree). In a 2016 study at the Ben Gurion University of the Negev it was found that 73% of trained paramedics stop working within a five-year period, and 93% stop treating within 10 years. In the United Kingdom, ambulances were original municipal services after the end of World War II. Training was frequently conducted internally, although national levels of coordination led to more standardization of staff training. Ambulance services were merged into county-level agencies in 1974, and then into regional agencies in 2006. The regional ambulance services, most often trusts, are under the authority of the National Health Service and there is now a significant standardization of training and skills. The UK model has three levels of ambulance staff: internally trained Emergency Care Assistants, who are trained to provide support and assistance to their Ambulance Technician and Paramedic colleagues, Ambulance Technicians, which are similar to EMTs in the US, and Paramedics with advanced life support skills. Initially, paramedics were mainly trained internally, with experienced ambulance technicians often progressing to the role of paramedic. Increasingly, however, university qualifications are being expected for paramedics, with the entry level being an Honours Bachelor of Science degree in Pre-Hospital Care or Paramedic Science. As the title "Paramedic" is legally protected, those utilising must be registered with the Health and Care Professions Council (HCPC), and in order to qualify for registration you must meet the standards for registration, which include having a degree obtained through an approved course. Paramedics work in various settings including NHS and Independent Ambulance Providers, Air Ambulances, Emergency Departments and other alternative settings. 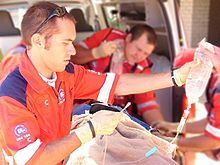 Some paramedics have gone on to become Paramedic Practitioners, a role that practices independently in the pre-hospital environment in a capacity similar to that of a nurse practitioner, but with more of an acute care orientation, and Critical Care Paramedics who specialise in acute emergency incidents. In 2018, the UK government changed legislation allowing Paramedics to independently prescribe, which will open new pathways to Paramedics to progress into. This will came into force on the 1st of April 2018, but has yet to affect practice due to guidance still being written. In the United States, the minimum standards for paramedic training is considered vocational, but many two-year colleges offer a paramedic associate degree option. Paramedic education programs typically follow the U.S. NHTSA EMS Curriculum, DOT or National Registry of EMTs. While many regionally accredited community colleges offer paramedic programs and two-year associate degrees, a handful of universities also offer a four-year bachelor's degree component. The national standard course minimum requires didactic and clinical hours for a paramedic program of 1,500 or more hours of classroom training and 500+ clinical hours to be accredited and nationally recognized. Calendar length typically varies from 12 months to upwards of two years, excluding degree options, EMT training, work experience, and prerequisites. It is required to be a certified Emergency Medical Technician prior to starting paramedic training. Entry requirements vary, but many paramedic programs also have prerequisites such as one year required work experience on an ambulance, or anatomy and physiology courses from an accredited college or university. Paramedics in some states must attend up to 50+ hours of ongoing education, plus maintain Basic Cardiac Life Support and Advanced Cardiac Life Support. National Registry requires 70 + hours to maintain its certification or one may re-certify through completing the written computer based adaptive testing again (between 90-120 questions) every two years. Paramedicine continues to grow and evolve into a formal profession in its own right, complete with its own standards and body of knowledge, and in many locations paramedics have formed their own professional bodies. The early technicians with limited training, performing a small and specific set of procedures, has become a role beginning to require a foundation degree in countries such as Australia, South Africa, the UK, and increasingly in Canada and parts of the U.S. such as Oregon, where a degree is required for entry level practice. As a part of Emergency Medicine Reform in 2017 MOH of Ukraine introduced two specialties — paramedics and emergency medical technicians. In Ukraine a paramedic is a person with a level of education not lower than a junior bachelor of the field of knowledge "Healthcare" and the corresponding specialization. This means that after 11 years of school, in order to become a paramedic, he needs to study for another three years. For a person with basic nine-year education, the term of training will be four years. In Ukraine paramedics provide an ALS level of care. They work in ambulances with EMTs. Firefighter paramedics assist a simulated burn victim during a US Navy mass casualty drill. Paramedics are employed by a variety of different organizations, and the services they provide may occur under differing organizational structures, depending on the part of the world. A new and evolving role for paramedics involves the expansion of their practice into the provision of relatively basic primary health care and assessment services. Some paramedics have begun to specialize their practice, frequently in association with the environment in which they will work. Some early examples of this involved aviation medicine and the use of helicopters, and the transfer of critical care patients between facilities. While some jurisdictions still use physicians, nurses, and technicians for transporting patients, increasingly this role falls to specialized senior and experienced paramedics. Other areas of specialization include such roles as tactical paramedics working in police units, marine paramedics, hazardous materials (Hazmat) teams, Heavy Urban Search and Rescue, and paramedics on offshore oil platforms, oil and mineral exploration teams, and in the military. 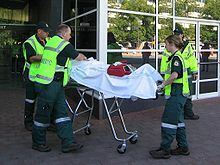 The majority of paramedics are employed by the emergency medical service for their area, although this employer could itself be working under a number of models, including a specific autonomous public ambulance service, a fire department, a hospital based service, or a private company working under contract. In Washington, firefighters have been offered free paramedic training. There are also many paramedics who volunteer for backcountry or wilderness rescue teams, and small town rescue squads. In the specific case of an ambulance service being maintained by a fire department, paramedics and EMTs may be required to maintain firefighting and rescue skills as well as medical skills, and vice versa. In some instances, such as Los Angeles County, a fire department may provide emergency medical services, but as a rapid response or rescue unit rather than a transport ambulance. The provision of municipal ambulance services and paramedics, can vary by area, even within the same country or state. For instance, in Canada, the province of British Columbia operates a province-wide service (the British Columbia Ambulance Service) whereas in Ontario, the service is provided by each municipality, either as a distinct service, linked to the fire service, or contracted out to a third party. Advanced cardiac life support, or ACLS, treats areas involving cardiac injury or compromise; the most common is cardiac arrest. Since the heart and nervous system begin to degrade in as little as 4–6 minutes, early recognition and treatment in the pre-hospital setting is very effective in life saving treatments. Using many devices and treatment modalities, such as Cardiac Monitors, Defibrillators, and cardiac medications, the chief objective is to stop and reverse the effects of lack of cardiac output. Sympathomimetics such as dopamine, dobutamine, norepinephrine, and epinephrine used for severe hypotension (low blood pressure), cardiogenic shock and septicemia. As described above, many jurisdictions have different levels of paramedic training, leading to variations in what procedures different paramedics may perform depending upon their qualifications. Three common general divisions of paramedic training are the basic technician, general paramedic or advanced technician, and advanced paramedic. Common skills that these three certification levels may practice are summarized in the table below. The skills for the higher levels automatically also assume those listed for lower levels. The medicolegal framework for paramedics is highly dependent on the overall structure of emergency medical services in the territory where they are working. Paramedics load an injured woman into an air ambulance after a head-on collision in the Kawartha Lakes region of Ontario, Canada. In many localities, paramedics operate as a direct extension of a physician medical director and practice as an extension of the medical director's license. In the United States, a physician delegates authority under an individual state's Medical Practice Act. This gives a paramedic the ability to practice within limited scope of practice in law, along with state DOH guidelines and medical control oversight. The authority to practice in this manner is granted in the form of standing orders (protocols) (off-line medical control) and direct physician consultation via phone or radio (on-line medical control). Under this paradigm, paramedics effectively assume the role of out-of-hospital field agents to regional emergency physicians, with independent clinical decision. In places where paramedics are recognized health care professionals registered with an appropriate body, they can conduct all procedures authorised for their profession, including the administration of prescription medication, and are personally answerable to a regulator. For example, in the United Kingdom, the Health and Care Professions Council regulates paramedics and can censure or strike a paramedic from the register. In some cases paramedics may gain further qualifications to extend their status to that of a paramedic practitioner or advanced paramedic, which may allow them to administer a wider range of drugs and use a wider range of clinical skills. In some areas, paramedics are only permitted to practice many advanced skills while assisting a physician who is physically present, except for immediately life-threatening emergencies. Emergency! was a popular 1970s television series which centered on the work of paramedics in the Los Angeles County Fire Department, and the staff at the fictional Rampart Emergency Hospital. Emergency! has been widely credited with inspiring many municipalities in the United States to develop their own paramedic programs, and acted as an inspiration for many individuals to enter the fields of emergency medicine. The show rated well for its entire production run (1972–77), as well as in syndicated reruns, and inspired a related cartoon series. Mother, Jugs & Speed is a 1976 comedy film, starring Bill Cosby, Raquel Welch, and Harvey Keitel. The film depicts a private ambulance company struggling to survive in Los Angeles, and gives an indication of the state of the ambulance industry just prior to its increased professionalism. Casualty is a long-running British BBC television series (1986–present), depicting the fictional Holby City Hospital's Accident and Emergency Department, and the related paramedics. Casualty has inspired the spin-off series, Holby City, and a number of made-for-television films. Paramedics is a 1988 American comedy film focussing on a group of paramedics in a US city. Paramedic: On the Front Lines of Medicine, is a 1988 autobiographical account of a paramedic's first year on the job by Peter Canning. A sequel, Rescue 471: A Paramedic's Stories was released in 2000. Bringing Out the Dead is a 1999 American drama film, directed by Martin Scorsese and starring Nicolas Cage, showing forty-eight hours in the life of a burnt-out paramedic in New York's Hell's Kitchen. The film is based on the novel of the same name by Joe Connelly, a former New York City paramedic. Paramedics is an American reality television show that originally screened from 1999 to 2001, and now runs intermittently on the Discovery Health Channel. The show features the life and work of emergency medical squads in major urban centers in the United States. Third Watch (1999–2005) is an American television drama, parts of which focused on the firefighters and paramedics of the New York City Fire Department. Shinjuku Punk Rescue Ambulance is a 2000 Japanese comedy drama TV series which aired on Nippon Television in Japan. The story is about two young Tokyo Fire Department ambulance technicians at Shinjuku West District and working with medical staff of Juniso Hospital. The show is also demonstrating how to deal with various emergency scenarios with first aid techniques at the ending of each episode. Into the Breach: A Year of Life and Death with EMS is a 2002 book written by J. A. Karam, focussing on real-life stories of paramedics, emergency medical technicians, and heavy-rescue specialists fighting to control trauma and medical emergencies. Saved is a 2006 medical television drama centered on a fictional paramedic, his partner, and their chaotic lives on and off the job. Black Flies is a 2008 American novel written by Shannon Burke, based on his experiences working as a paramedic in Harlem, New York. In NBC's sci fi drama Heroes (2006, 2010), the character Peter Petrelli uses his abilities to save 53 people while working as a paramedic. Code Blue: Doctor-Heli (2008, 2010) is a Japanese television medical drama which aired on Fuji TV Network. It is centered on the lives and work of flight physician trainees with the air ambulance program of the fictional Shoyo University Hokubu Hospital Emergency Center. Trauma is a 2009–10 American television drama series focusing on a group of San Francisco Fire Department paramedics working in conjunction with the fictional trauma center of San Francisco City Hospital. Recruits: Paramedics is an Australian television series airing on Network Ten, depicting the work of trainee paramedics recently employed with the Ambulance Service of New South Wales. Denise Sherwood on Army Wives was a paramedic, having been a nurse beforehand and a 911 dispatcher later. F.S.D. is a 2011 Hong Kong action-drama TV series which was co-produced by RTHK and the Hong Kong Fire Service Department. It is focused on the work and lives of ambulancemen and firemen in the Hong Kong Fire Service Department. The second episode, "Caring with Love", and fifth episode, "Call for Duty", are centered on the ambulancemen and paramedics particularly. Sofia's Last Ambulance (2012) is a feature-length documentary by Ilian Metev about a dedicated ambulance crew in Sofia, Bulgaria. The film premiered at Cannes in 2012. Elite Brigade is a 2012 Hong Kong action-drama TV series co-produced by RTHK and the Hong Kong Fire Service Department after the previous series F.S.D. succeeded in 2011. The story carries on to tell the work of ambulancemen and firemen in the Hong Kong Fire Service Department. 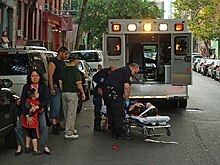 The third episode, "First Responders", is centered on the ambulancemen and paramedics who face a double-decker bus crash during rush hour, with mass victims on scene. Trauma Team, a surgery video game for the Nintendo Wii, features a playable paramedic named Maria Torres whose playstyle centers around managing and stabilizing multiple accident victims at once. In the game Metal Gear Solid 3, Dr. Clark, nicknamed Para-Medic, dreams of creating a unit of medics able to parachute down to an emergency location. Junior Paramedics is a British television series that was first broadcast on BBC Three on 27 February 2014. The series follows paramedics on a six-week placement with East Midlands Ambulance Service. Boston EMS is a medical documentary series which premiered on ABC on July 25, 2015. It follows one of America's most seasoned teams of first responders in Boston, Massachusetts. Nightwatch is a 2015 American reality television show that airs on the A&E channel that focuses on the EMTs and paramedics of the New Orleans Emergency Medical Services, as well as the firefighters of the New Orleans Fire Department, and the police officers on the New Orleans Police Department. Ambulance, a BBC documentary which first aired in 2016, originally followed paramedics in the London Ambulance Service, and since 2017 has followed paramedics in the West Midlands Ambulance Service. ^ "Salaries, Strong Recruitment Ease Area Paramedic Shortage". Archived from the original on September 8, 2011. ^ "What's the Difference Between an EMT and a Paramedic? | UCLA CPC". www.cpc.mednet.ucla.edu. Retrieved 2018-09-12. ^ Evans, Rachel; McGovern, Ruth; Birch, Jennifer; Newbury-Birch, Dorothy (2012). "Which extended paramedic skills are making an impact in emergency care and can be related to the UK paramedic system? A systematic review of the literature". Emergency Medicine Journal. 31 (7): 594–603. doi:10.1136/emermed-2012-202129. PMC 4078671. PMID 23576227. ^ "Toronto EMS: History". Toronto EMS. ^ "1967-Metro Ambulance Service (Atlanta, Georgia)". National EMS museum. Archived from the original on 14 April 2013. Retrieved 9 October 2014. ^ "HCPC - Health and Care Professions Council - Protected titles". www.hcpc-uk.co.uk. Retrieved 2016-02-08. ^ "Entry requirements and training (paramedic)". Health Careers. 2015-04-23. Retrieved 2018-03-19. ^ "HCPC - Health and Care Professions Council - Standards". www.hcpc-uk.org. Retrieved 2018-03-19. ^ "Legislation changing to enable patients to benefit from paramedic independent prescribers | News". www.collegeofparamedics.co.uk. Retrieved 2018-03-19. ^ "Independent Prescribing | Professional Development". www.collegeofparamedics.co.uk. Retrieved 2018-04-15. ^ "Degree Programs in EMS". www.naemt.org. Archived from the original on 2015-06-26. ^ "Emergency Medical Technician-Paramedic - CAAHEP". www.caahep.org. Archived from the original on 2015-07-08. ^ "What's the Difference Between an EMT and a Paramedic? - UCLA CPC". www.cpc.mednet.ucla.edu. ^ "National Registry of EMTs". ^ "Paramedic Schools in Oregon with Training Program Overviews". ^ a b "MOH order from 09.08.2017 р. № 918" (in Ukrainian). www.apteka.ua. November 1, 2017. Retrieved January 13, 2018. ^ a b Oleksandr Danyljuk (December 1, 2017). "Paramedicine in Ukraine to be. Who is affected and how will it work?" (in Ukrainian). 112 Ukraine. Retrieved January 13, 2018. ^ McCaffrey, Raymond (2008-04-04). "Salaries, Strong Recruitment Ease Area Paramedic Shortage". The Washington Post. ^ De Backer D (2011). "Treatment of shock". Acta Clinica Belgica. 66 (6): 438–442. ^ "Advanced Practice Paramedic: Paramedic Ultrasound". "Tribute to R Adams Cowley, M.D." University of Maryland Medical Center. Retrieved 2005-12-30. "National Scope of Practice Model" (PDF). National Highway Traffic Safety Administration. Retrieved 2012-11-11. Conaghan, Joseph. Coach and horses: my history in the ambulance dispute 1989/90. Glantaff House, 2010. Look up paramedic in Wiktionary, the free dictionary. 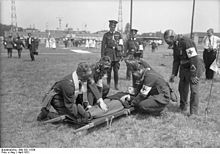 Wikimedia Commons has media related to Paramedics.